Yesterday, Maria mentioned to me over the phone that I've been in longyearbyen for nearly two weeks and haven't gone anywhere. I laughed out loud at the statement. She has a unique ability to cut to the core of any situation. Of course, I did get off on a slight technicality. Rob, Jeff and Ankur and I were out on a three-day training trip in the middle of my time here (which was awesome by the way). 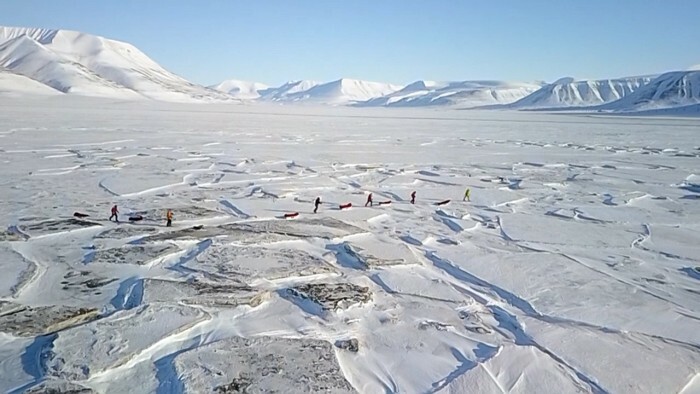 Still, it's April 8th and my team (Rob, Jeff, Ankur, Dave, Bruno and Dean) and I were scheduled to fly to the temporary ice camp of Barneo (usually positioned somewhere near the 89th parallel) on the 4th. Not surprisingly, the logistics entailed in both setting up and maintaining a temporary camp on the Arctic Ocean (moving sea ice) that is capable of landing a jet on while shuttling tourists back and forth from the North Pole is no small feat. Needless to say, there are helicopters, planes, parachuting bull dozers and more involved in just the first step of getting runway constructed - which has actually been completed for several days. With the ice runway constructed, the only missing piece was an Antov-74, a Russian jet capable of short landing and take offs while hauling both cargo and passengers. Slightly delayed, the Antonov arrived on Friday. But curiously, the crew wouldn't initially get off the plane. Then, despite a prior signed prior contract and payment with Ukrainian Antonov Airlines, the crew refused to fly to Barneo - a perplexing situation to us all. In the end, we received this update, "some Russian powerful people do not want the Ukrainian aircraft to come to Barneo, whereas some Ukrainian powerful people do not want to fight with them and preferred to stop the aircraft in Longyear." Ironically, they both don't want the plane used: the Russians don't want a Ukrainian aircraft to be used for Barneo operations (because, I guess, they don't like the Ukrainians) and the Ukrainians do not want a Ukrainian aircraft to be used for Barneo operations (because they think it's a solely Russian base and they don't like the Russians). Stuck in between all this is my team and nearly 60 other 'Last Degree' skiers stranded in Longyearbyen. And for better or worse, I'm not totally surprised by all this. We've run into similar problems in prior years here. Last year, it was permits for the helicopters. In 2005, my expedition partner and I were marooned in a small tent on the sea ice off the coast of Cape Arktichesky (Siberia) for nine days where waited because of fuel shortages, Russian National holidays, and who knows what else. I have never been so close to the end of my rope as I was then. While I may not (obviously) be an expert in Russian politics, I've often said that, "things are a problem until they aren't". Often times, it takes things reaching a crisis before the problem is resolved, and seemingly, immediately forgotten as well. But delays in this type of travel are common. In 2016, we had to wait 12 days in Longyearbyen due to a cracked ice runway. In fact, I added it up today and I think I've spent more time being delayed in Longyearbyen than actually leading 'Last Degree' North Pole expeditions!?! Crazy. But also crazily normal. So now, here we are. Or here I am - at least for now. Our future is uncertain. I've always had confidence in the crew that operates Barneo but a few cracks are starting in from the edges. I am still optimistic (my normal perspective about most things) about the season happening, but I am simultaneously starting to adopt a more 'realistic' view point. We are insignificant little pawns in a bigger geopolitical game that has been going on for several years. To take our mind off the bigger forces at play (and outside our control) we geared up and headed out for a short training ski this afternoon. Adventdalen, the long valley that runs out from Longyearbyen, was filled with a rich light as we zig zagged through small pans of ice practicing for our own bigger game of skiing to the North Pole on the Arctic Ocean. Image: Today's short training ski just outside of Longyearbyen.